View of Half Dome in Yosemite, with Merced (?) bridge. Half Dome looms up on right under cloudy sky. In foreground, river flows under bridge past brown banks where trees of various types, including pine, grow and are reflected in water. 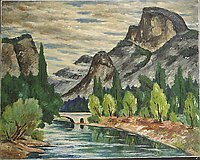 Written on back, top left center: Half Dome of Yosemite, 39" x 31"
The conservative, closely framed composition, with expressive brushstrokes and thick application of paint, is typical of Sugimoto's early period. The heavy sky and white and blue tones in the water are also common to Sugimoto's treatments of landscape and natural subjects in this period. Flat applications of color, as in the pine trees at center left, tend toward abstraction. As with other early landscapes, the question arises as to how much time Sugimoto spent working on composition in the studio and how much time was spent outdoors painting or sketching. The choice of Yosemite's Half Dome points toward the artist's interest in more sublime American landscapes for his early works (his renditions of Carmel and the Northern California coastline date to the same period, for example), and begs comparison to Sugimoto's work with European landscapes.